This is how paperclips are made. I could watch it all day. The history of the paperclip is somewhat of a mystery. 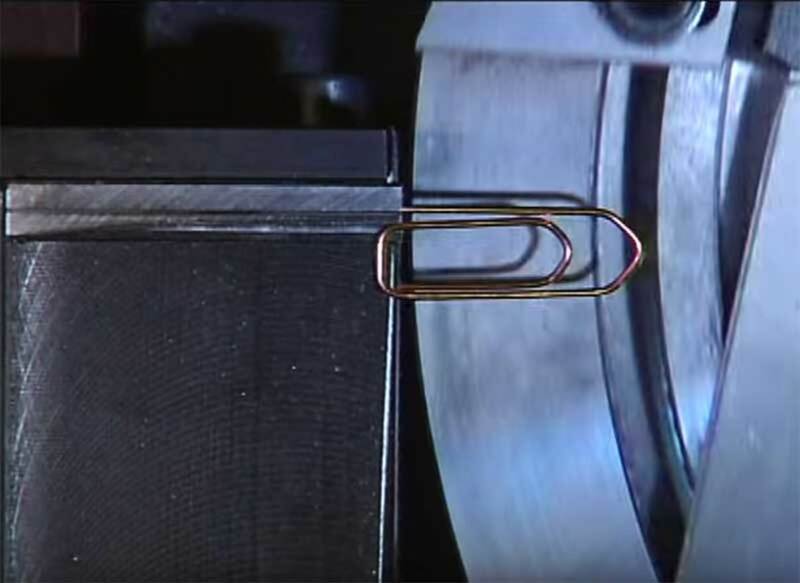 The machine above seems to be making a Gem type paperclip, which is the most common and was never patented. This is taken from an 1899 patent for a paperclip machine (not the paperclip itself). In the early 1990s Chinese factories were producing so many paperclips that the US introduced anti-dumping tariffs against imports from China. Paperclips became a symbol of resistance, mainly in Norway, and were worn on clothes in protest at the occupation and at Nazi-ism in general. The reason for this was the mistaken belief that the paperclip was created by a german-Jewish inventor, Johan Vaaler. He did invent a new version of the paperclip, but not the original. The paperclip is also now the universal symbol for an attachment, beating out its rivals the paper fastener, staple and bulldog clip.